8. SAVE TIME: Get a display that is faster to set up and tear down. That way you can arrive later at the show, and leave the same day the show ends, saving a day or two. You only have one chance to make a first impression. Compex Display listens to your needs, understands your goals and then builds trade show displays that allow your company brand and marketing message to stand out from the competition. We offer custom portable exhibits and custom modular displays in a variety of styles and configurations and trade show accessories—like furniture, hanging signs, flooring and pop-up displays—that provide an effective and efficient exhibit environment. All of our exhibit displays are made of the highest quality materials and include sturdy cases that protect your investment. Check out our collection of exhibit rentals and accessories. Usually it’s sales and marketing people like us who manage our companies’ trade shows, and we’re notorious for having more than a touch of A.D.D. 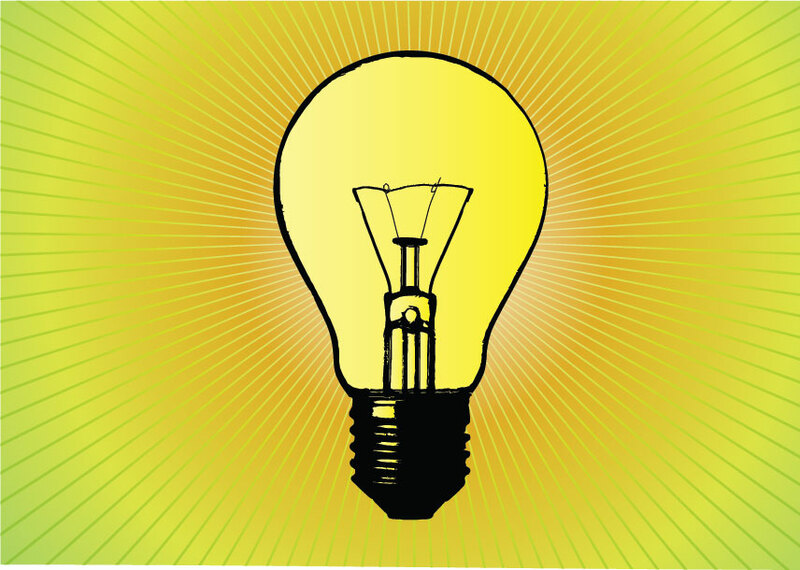 Marketing people need that endless curiosity that sparks a creative marketing ideas and sales people are known for doing whatever it takes to get the sale – and then going on to the next sale before all the details are nailed down on the first one. Promotions:When A.D.D. trade show marketers wait until the last minute, they run out of time to do pre-show or at-show promotions, which require weeks, even months to ideate, plan, source, and deliver. And without doing promotions, exhibitors get fewer visitors to their booth, reducing their program’s results and ROI. To stay competitive in their specific industries, a number of business owners rely on their trade show exhibits to generate continued customer interest and to showcase how their companies stand above others in the same niche. As the new trade show season is starting, many are evaluating their current approach to exhibiting at one or more of these shows. 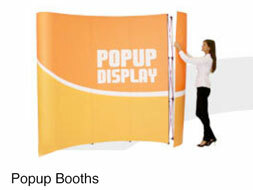 In order to have a top-notch trade show booth, preparation typically starts months ahead of time. Owners and managers are looking at the hard numbers from past years and considering how they can possibly bring in more sales revenue to surpass the initial expense of a trade show display. Revamping a set of banners and backdrops is one proven way to attract more interest from trade show visitors, and a new display will send the message that a company is up to date on current trends for marketing and promotion. For interested business owners planning a new trade show display, the first planning stage involves looking at how well a booth design and layout fit with the company culture. 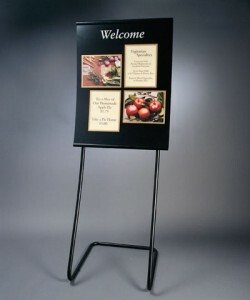 Marketing messages also play a big role in the final exhibit’s appearance and overall set-up. Elements to plan and select include banners screen-printed with photos, graphics and company logos. For clients who have questions about where to start with a new exhibit, consulting a professional trade show booth designer can help with these early planning stages. Consultants offer suggestions for banner displays that will fit with each customer’s type of business, trade show budget, available floor space and specific marketing goals. For any small business, trade shows can provide an effective means of spreading brand awareness, getting your product out in front of a target audience and meeting with current or potential clients. But there’s much more to it than reserving your space and signing on the dotted line. 1. Why am I participating in this show? “There really has to be a why,” says D.J. Heckes, CEO of trade show management company Exhib-it and author of Full Brain Marketing. People sign up for a show for a number of reasons: It can serve as a launching pad for new products or concepts, a way to build up your brand and distribution, a means of nurturing relationships or even a place to position your company for sale. Once you nail down a clear motive that aligns with your business strategy, reach out to customers and find out if they are attending and if the show fits their timing and needs. 2. Am I organized for the show? Preparing for a show well in advance can save you both time and money. For example, if you sign up early, you can take advantage of discounted rates, which can be considerably less than prices charged within 60 or 30 days of an event. On the other side of the spectrum, if you are disorganized, you may incur additional costs. One instance where you might get penalized is if you forget to bring something and need to have it delivered to the show. You not only will have to pay for shipping and handling but the show may slap on hidden costs. 3. How much space will I need? While it’s nice to have a large footprint on a trade show floor, those who can’t afford it shouldn’t worry, says Michael Brody-Waite, CEO of InQuicker, a health-tech company focused on connecting consumers with services. Brody-Waite’s approach is to invest in a simple booth presentation and then doing everything he can to capture contact information and follow-up with these leads after the show. For him, it is more about these meaningful connections, conversations and ability to covert prospects to actual customers than the complexity of a booth. “The way we look at it, if we can’t have impactful conversations with a single booth space, simply adding more real estate probably isn’t the right solution,” he says. 4. Does it matter who my neighbors are? Absolutely. But how you view your neighbors is where views diverge. Maureen Burke isn’t a fan of being placed next to a show-stopping booth. The senior account director at Nth Degree, an event marketing and management company, warns against having your small booth next to an extravagant presentation (think lots of signage and activity). This kind of placement can distract potential customers from your message and products. “You’re not just competing against other companies who make the same product, but everyone who is exhibiting there,” she says. However, Brody-Waite has a different perspective. He likes to secure a booth near flashier ones that will likely attract a lot of foot traffic. If another company is doing the heavy lifting to get people in a certain area, why not capitalize on it, he says. 5. Should I sponsor events in conjunction with the trade show? Brody-Waite believes in attending trade shows not only as an exhibitor, but also as a sponsor or presenter, as it affords the best opportunity to inform and educate an audience. 6. Who am I targeting at the show? A show might have tens of thousands of attendees trekking through the event but participants need to figure out who specifically they are targeting and how they plan on reeling them in. Some companies get stuck on the number of people who stop by the booth, instead of looking at whether they are qualified buyers of your goods and services. 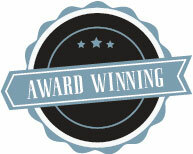 “Are you looking for 1,500 basic leads or 200 well-qualified leads? Are you looking for shallow and wide exposure or narrow and deep?” Burke of Nth Degree says. By qualifying the type of people you hope to reach, you can plan your presentation more effectively. 7. How am I going to measure my attendance and presence at the show? In addition to counting leads, it’s important to measure marketing impressions at the show. Just like you can see how many people view an ad in a magazine, you want to know how many people are viewing your marketing materials like signage on the show floor. Burke suggests working with the show organizer to get numbers. 8. Am I familiar with the host city and venue? When you’re planning to exhibit at a show, it’s important to know about the city you’re visiting, as well as the rules and regulations of the convention center, including the associated unions and contractors. 9. Have I backed up my presence through social media? Keeping your customers informed about your company’s activities before, during and after the trade show is crucial, Heckes of Exhib-it says. In addition to sending out a press release, you can post tweets about why people should come see you at the show. Possible incentives include a new technology, a prize drawing or a gift for stopping by. Other relevant social media efforts can include blogging from the show floor, making regular updates on Facebook and posting videos of customers visiting your booth on your website. 10. Do I have a post-show plan? It takes a lot of money to plan and exhibit at a show. Don’t let all your effort go to the wayside by not being active after the event is over. In this competitive world, if you don’t respond to leads within two or three days, your competitors will,” Heckes says She recommends having a sound plan for following up with people immediately after the show is over. If you have an app where you can send out information in real time at the event, all the better. “If you wait two or three weeks, you’ve missed your window,” Heckes says. First time exhibitors can find themselves in a bind when they don’t fully read the “Exhibitor Rules and Regulations” document published in the respective trade show kit. The physical logistics of exhibiting at a trade show are often left until the end of preparation and then completed in a hurry. Start planning the physical side for your shows at least nine months in advance. Before registering to participate as an exhibitor you should understand that the fee to rent a space is a small part of the overall cost of the show. As an exhibitor you should determine how many shows you can afford to attend over the course of a year. Download and read each show’s rules and regulations before registering and understand the requirements of each show. 1) Do I need to supply a physical booth structure within my rented space? 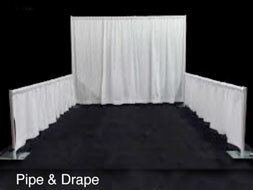 Some shows use pipe and curtain backdrops and other show organizers insist that a complete stand-alone booth (back and sides) must be used and are not supplied. 2) How tall can the booth be within my allotted space, at the back, sides, and front of the space? 3) Will the booth space be carpeted or do I have to supply my own flooring? 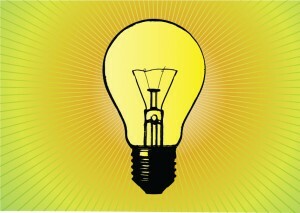 4) Do I need to purchase utilities for my booth such as water, electricity or even fuel for cooking? 5) What security is available before, during and after the show? Do I have to pay for security? 7) How long after the show do I have to remove the booth? 8) How am I going to transport my booth to the show sites? 9) Will I need accommodation for the duration of the show? Based on answers to these questions you can begin to develop a budget for each show. 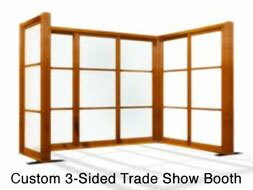 The physical cost has to be tallied before you can begin designing your booth layout. Once you meet the physical needs you can start addressing the ‘wants’ for your booth. 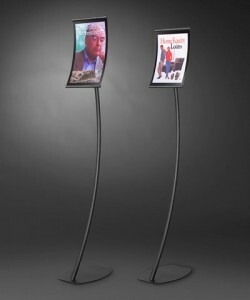 Using the same product line for all of your display sings lends a professional look to your business. Check out our Concurva, Linea, and AeroLinea product lines for all of your display needs. From item identifiers (business card size) up to our floor stands (22″ X 28″ poster size) all three of our product lines give you a consistent professional appearance for your display needs. Greet your guests, direct your clients, inform your customers, all with Visual Display systems from Compex Display. 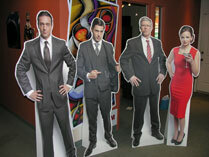 Recently one of our customers ordered 4 life sized cut-outs. Digitally printed on foamcore and custom cut with stands. 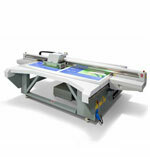 At Compex we specialize in large format printing using the Arizona 250GT Flatbed. 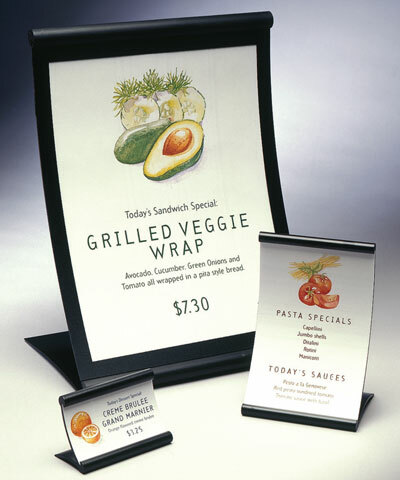 Our printer produces near-photo quality prints onto rigid and flexible media for sign and display graphic applications. 3 year outdoor and with lamination we can extend the life to 5-7 years. See our Custom Sign Menu for completed examples.